This fresh corn salad with cherry tomatoes and avocado is a simple summer salad that only uses a few ingredients. It comes together quickly using late summer produce. 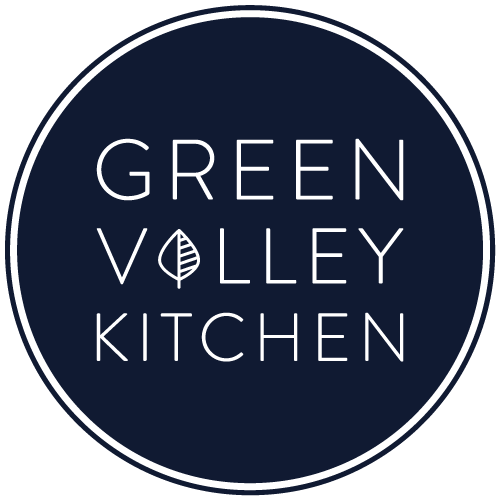 It features fresh corn, sweet cherry tomatoes and creamy avocado tossed in a zesty lime vinaigrette. With summer winding down and Labor Day parties around the corner, I thought I’d share this healthy, fresh corn salad with cherry tomatoes and avocado. I was inspired by all the late summer produce at the farmer’s market – there were tables piled high with fresh corn. This is a raw corn salad – there’s no need to cook the corn if you are using really fresh corn. There are just a few ingredients in this recipe – and it’s quick to make. 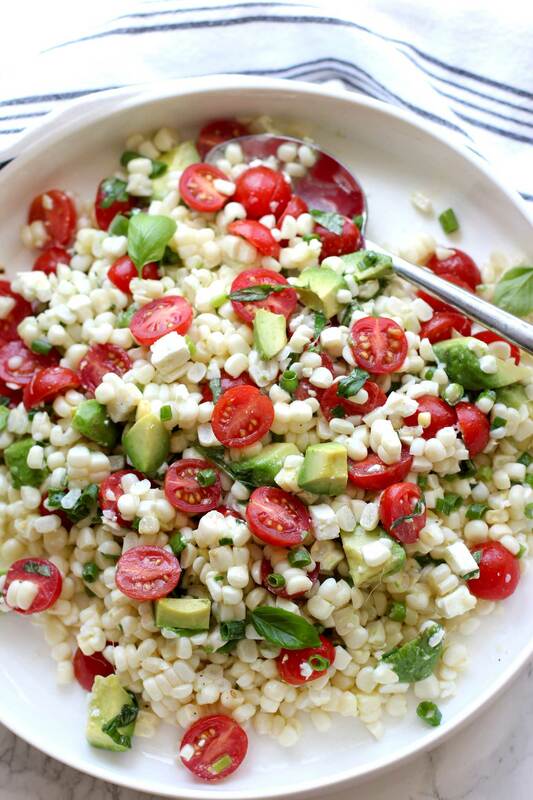 Fresh corn is tossed with sweet cherry tomatoes, creamy avocado, salty feta, scallions and fresh basil. The dressing is a zesty lime vinaigrette and it really pulls all the flavors together. You can make this dish ahead, just don’t add the avocados until just before serving. This dish holds up well in the fridge – but without the avocado. The avocado will turn brown quickly – so if you want to make it ahead or are planning on having extra for the next day then don’t add the avocado. Only add the avocado just before serving. If you make extra, this works well tossed with cooked quinoa – an easy lunch idea to use up those leftovers. If your corn still has the stalk on – don’t remove it when you husk the corn. It will act as a natural handle when you slice the corn kernels off the cob. Recipe adapted from this Food Network recipe. This fresh corn salad with cherry tomatoes and avocado is a simple summer salad that uses fresh corn, sweet cherry tomatoes and creamy avocado tossed in a zesty lime vinaigrette. 4 ears of fresh corn – slice the kernels from each ear of corn. 1 to 1 1/2 cups cherry tomatoes – sliced in half. 2 ounces of feta cheese – diced into small cubes. 3 scallions – finely sliced – I used only the green part of the scallion and discarded the white bulb end. 1 ripe avocado – diced and removed from peel. 10 basil leaves – finely minced. I cut mine into long thin slices. 1/2 of a lime – juiced. 1 small clove of garlic – minced. Husk corn and slice off kernels using a sharp knife into a large shallow bowl. Cut down and away from yourself. Slice cherry tomatoes in half and add to the bowl with the corn. Dice feta and add to the bowl. Slice scallions into thin pieces and add to the bowl. Dice avocado and add to the bowl. Add minced basil to the bowl. Whisk together dressing ingredients and pour over salad. Toss together ingredients and let sit for 10 to 15 minutes for flavors to meld. When slicing fresh corn off the cob, hold the cob over a large shallow bowl and cut down and away from yourself so there’s no chance of slipping and cutting yourself. This dish is easy to double if you are serving to a larger crowd. I usually plan on one ear of corn per person. You want to slice the scallions into thin slices – big pieces will be too overpowering in this salad. Used frozen corn, this recipe worked perfectly, felt no guilt ar all! Loved the photos. I hadn’t thought of using frozen corn but that’s a great idea! Thanks for leaving a comment and a rating. Such an awesome combination of fresh and healthy ingredients in this salad recipe, Geraldine! Can I use lemon instead of lime juice? Hi Agness – I don’t think lemon will work. If you don’t have lime then white wine vinegar would be a good alternative. Such a great recipe to use all the market corn for the end of the summer! This looks like a salad I want to keep in my fridge at all times. It would be great on a grilled steak, salmon or fish. Or I would pile it on some quinoa and eat it for lunch. Gorgeous! Thanks, Karen – I did just that – used the leftovers on quinoa the next day! Mmmmm- perfect way to end the summer! I never met a corn salad I didn’t love!! Just beautiful, Geraldine!! I’m with you on the corn salads, Annie! I absolutely adore fresh corn, Geraldine. It’s crunchy, sweet and I love it chilled! No better time than now to eat it up too… our summer produce is late up here in the PNW.. so we’ll be enjoying heirloom tomatoes and corn into early October! This salad is such a delight… simple pleasures in late Summer! Love that you’re going to get to enjoy late summer produce until October, Traci – Enjoy! This is summer! Beautiful. I’ve never tried raw corn, so maybe I can start with lightly cooked corn?!! Hi Mimi – if you can’t find really fresh, just picked corn – then definitely saute it in a little olive oil before tossing with the rest of the ingredients. This salad is seriously EVERYTHING I love about summer, Geraldine! The produce is just SO amazing and when it’s fresh it tastes just incredible! 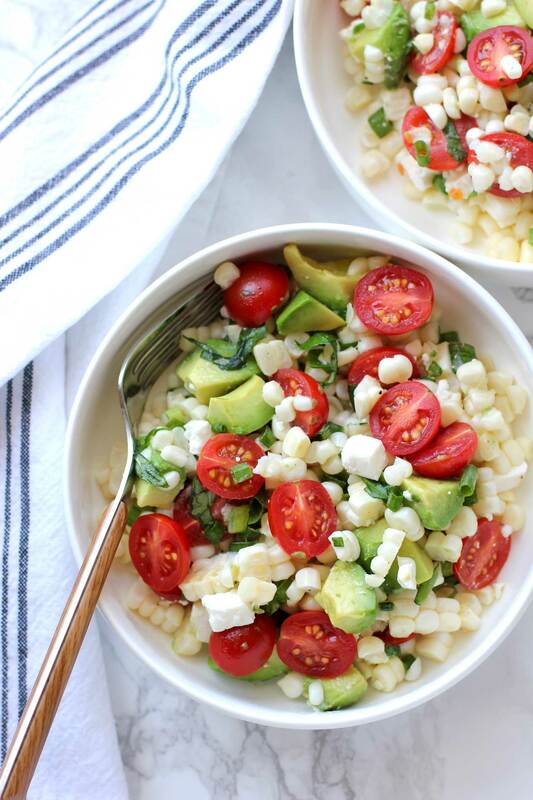 I’m corn obsessed, so this salad is definitely calling my name! Can’t wait to try this! Cheers, friend! Thanks, Cheyanne – I with you – I can’t get enough corn at the end of the summer! Love this fresh, summery salad Geraldine! We’ve still got lots of beautiful corn here in New Jersey too, so I’ll definitely need to give this a try. I love the avocado and the feta! You must have great corn on the Jersey shore, Mary Ann – hope you try this – you’ll love it!